During his trip to Vienna, United Nations Secretary-General Ban Ki-moon today visited a restaurant where refugees work together with locals to serve Austrian-Arab fusion cuisine, using this opportunity to showcase the UN system-wide initiative to counter xenophobia launched in September. “I was very impressed having met the master chef and chef from the Philippines and Syria. Many people, millions of people, are suffering because of the Syrian crisis. This is a good way of integrating into Austrian culture,” Mr. Ban said in his remarks at the year-old Habibi & Hawara restaurant, which is run by a team of refugees and Austrians, aiming to help refugees become independent entrepreneurs. With millions of people on the move due to conflict, disasters and other crises, the UN chief recalled that he had launched the Together: Respect, Safety and Dignity for All campaign at the UN Summit for Refugees and Migrants on 19 September. He commended the Austrian community in that regard, asking not only Austrians but all Europeans and many people who can render their support as a part of “togetherness, the ‘Together’ initiative, that’s what I’m asking you,” Mr. Ban underscored. He noted that at least 16 million people are now caught in the middle of this fighting and violence in Syria. Mr. Ban has been urging world leaders, particularly in Europe, not to erect walls, but build a bridge between people, among people and between countries because those on the move have no other choice but to flee to save their lives to other foreign countries, stressing that it is unacceptable that leadership-level people and community people are showing discriminatory and xenophobic attitudes and making politically unacceptable remarks. “All these are unacceptable in the name of humanity,” he said. “We are together. We are the same brothers and sisters. We are the same people, men and women. There is no difference at all,” he said, noting that the UN is working over the next two years toward adopting a Global Compact that will ensure that all refugees will be supported based on global responsibility-sharing principles. 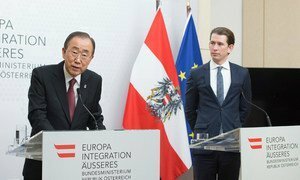 Kicking off what is likely to be his final overseas trip before leaving office at the end of the month, United Nations Secretary-General Ban Ki-moon arrived in Austria today, meeting the President-elect, foreign ministry officials, and press in Vienna.